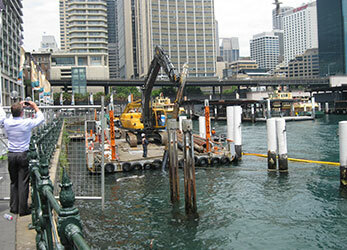 Clement Marine Constructions provides a maintenance service to Sydney Harbour for all Council and commercial operators. Many standard materials are stored at our Rozelle Depot allowing for the repair/replacement of structures in short lead times. Clement Marine Constructions hold relevant demolition licenses issued by Workcover NSW to complete all forms of demolition in and around the waterfront. Our experienced supervisors hold individual credentials enabling them to supervise demolition under the companies license and in addition, our engineering experience assists in ensuring that all demolition works are completed safely and risk mitigation measures are utilised wherever possible. Along with our staff expertise, Clement Marine Construction utilises several crane barges, excavators and attachments, as well as dumb barges to complete demolition works at the least expense, while recycling materials wherever possible.